Getting ready for a big show is exciting, nerve wracking, frustrating, and wonderful. The kids (my junior partners in all this) are looking forward to going on an airplane, something they haven’t done in a quite a while. I promised them we’d do Sakura-Con years ago, when we first stumbled upon it one Easter weekend in Seattle, and I’m glad to finally be fulfilling that promise. It’s been a long time coming, and a rough road to get this far. Due to the constraints of my current living situation, I have no idea how much stock I actually have as everything is packed in boxes here and there. How many kimono do I have? No idea. Hopefully enough. I’ll be digging through boxes this week and next sorting everything out and shipping it all off to the Seattle Convention Center with my fingers crossed. The last time I did a show this big, I nearly sold out. I’ve learned so much since then. My my first and last big show was Fanime Con in May, 2008. The kids and I stayed with my parents in the Bay Area for a week, during which time I barely slept, ate, or talked to my family. I worked on my feet all day, every day, and exhausting as it was, I loved it. At the end of the show we packed up the car with what was left and drove home to Oregon. Two weeks later my partner of five years dumped me. Soon after that, my mother called to tell me she’d been diagnosed with pancreatic cancer. I felt as though I was just starting to succeed in my career only to be faced with total devistation in my personal life. I moved to California to be with my parents in October, 2008. My mother passed away ten days later. My father passed away 11 months after that, followed three weeks later by my brother. And then there was that whole economy crash thing, but never mind. So this year we look at the world with fresh eyes, hoping for the best. My kids worry that things won’t go well (the past two years have been very hard on them) and I do my best to bolster their confidence. After 20 years of self employment, I’m pretty good at senseless and irrational optimism (in other words, believing that things will just have to work out, dammit). So there you have it, a little background on my life. And for those of you who don’t already know me, an image to show just how very un-Japanese I am. 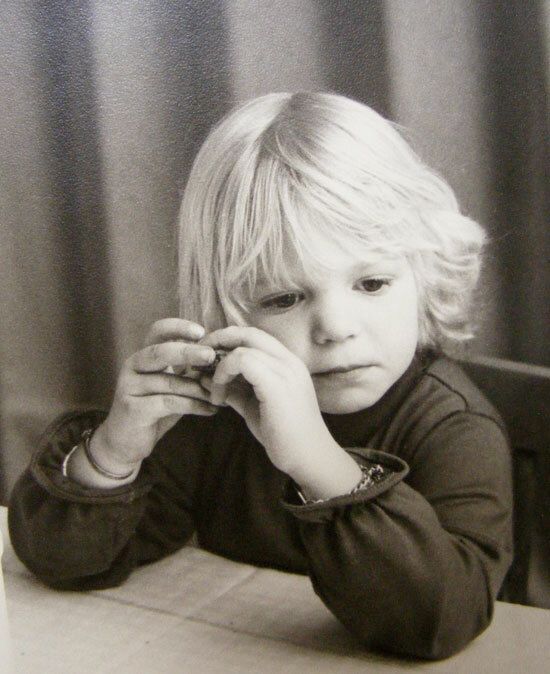 This was taken when I was about four years old. I still have that very serious look on my face most of the time. I was quite the philosophical little kid back then. Still am. I had no idea that you were black & white when you were younger!